“Kate Rickman looked down at her hands. Kate Rickman is a student, living in Exmouth attending Exeter University. Only her probation officer knows the truth about her, and thats how it has to stay. However when a none year old holiday maker goes missing the police are suspicious of her whereabouts on the night. They take her in to questioning and soon Kate knows that the complex web of lies about her life, about her past, isn’t as complex as she thought. Kate is still followed by the guilt of what happened eight years ago, she cannot forget about it and when she is met with serious hostility from the police, she knows her previous life will never leave her alone. Kate will forever be Jennifer Jones, no matter what name she goes by. Take me back to 2004 and you will find me behind the counter in my parents shop, trying to get a few sentences read before having to serve customers. A lot of the books I read back then were special to me, all my Sara Manning books and Harry Potter, they all kept a special place in my heart… but none as much as Looking For JJ, Anne Cassidy’s award winning novel. I love this book and when I was n my first year of university I went to see a stage adaptation of it. It has stay with me for years since and now Anne Cassidy has rewarded fans of the original book with a sequel in the form of Finding Jennifer Jones. The story picks up two years after the end of Looking for JJ. Kate Rickman is the characters new name, a name she was given after her first identity was released by a journalist looking for a scoop. I liked how grown up Kate appeared to be but her life was still shrouded in guilt and she still struggles with what she did and the way she is living. The reader gets to know Kate in the first couple of chapters then we are introduced to the idea of Kate being responsible for another little girls death. This part of the book was hard to read because of the scrutiny from the police officers. It was awful for Kate to put up with and you could tell that she was uncomfortable with the police officers because they were just telling her the things she already knew. The book is split up into parts and one of these was set in Norwich, back when the truth about what Jennifer Jones had done came out. I loved this bit because it showed how the character had been shaped, you found out more about her time in ‘the Facility’ and it helps you understand Kate and the way she is. Once that is over we move back to present time and wow, the events of the book are spectacular. There were some parts of the book that appeared a bit rushed to me, especially towards the end, which is why I have only rated the book 4 out of 5 but the story for the most part took up a good pace and kept me hanging on to find out exactly what would happen next. If you are a fan of Anne Cassidy, or psychological thrillers and crime books in general you must try this book, and Looking for JJ if you haven’t already! 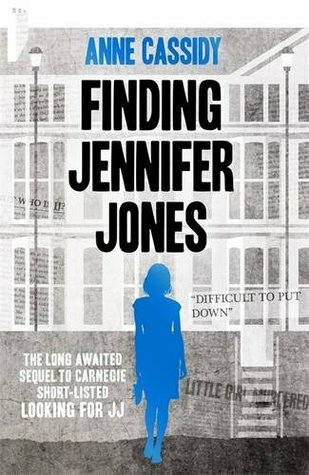 I think Finding Jennifer Jones did a great job of picking up a story I loved and adding to it in a way that felt right and as the recent Anne Cassidy books have been a slight disappointment in comparison to Looking For JJ, this was not at all. Finding Jennifer Jones will be published on Feb 6th by Hot Key Books. My copy was sent to me from the publisher in exchange for an honest review.